When a tooth is lost a couple of forces start to come into play. Firstly the tooth/teeth opposing the space will start to drift up/down. This can create cosmetic problems with the gum line on that tooth and may also cause bite problems. 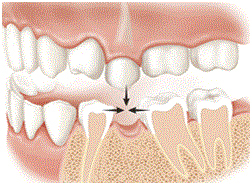 Secondly, the teeth either side of the gap will begin to drift inwards, over time they will tilt more and more. This can also affect the way your teeth bite together and possibly cause jaw joint problems. This tilting can also make future tooth replacement difficult should you decide to go ahead later on. We are pleased to say that patients are travelling from around the local Edinburgh area to have dental implants at EH Dental Care. Dental implants form the root of your tooth replacement, they are made from medical grade titanium which is bio-compatible and will not be rejected by your body.Over the top of this dental implant a new crown will be made. The Dental Implant(s) is/are placed into your jaw, usually under local anaesthetic. After a healing phase of between three and six months the final restoration can be placed. Because the body does not recognise the titanium implant as a foreign object it will fully integrate into your bone and form a stable base onto which to place the replacement tooth. Dental bridges replace your missing tooth by suspending it between the adjacent teeth. It is normally possible to suspend 2 or 3 new teeth in this gap. One of the biggest disadvantages with dental bridges is that they often necessitate removal of tooth structure from the teeth either side. This is in order to prepare the teeth to accept the support for the new tooth. Dental bridges have been used for many years and are a very successful way to replace missing teeth. Dentures are a removable replacement for missing teeth. Dentures can either be a replacement for all of your teeth, known as a full denture or a replacement for something, known as a partial denture. Suction. Full dentures stay in place by creating a suction over your gums, sometimes this can be improved by the use of denture fixatives. Clasps. These are clips which attach your denture to give the surrounding teeth, they are only used on partial dentures where the surrounding teeth are strong enough to support their denture. Dental implants. Two or four dental implants can be placed, the implants contain a little pop stud which the denture clips onto. This enables your denture to be securely fixed in your mouth. A really great way the stabilising dentures.EH Dental Care in Edinburgh is able to help you replace your missing teeth in a way that is right for you.